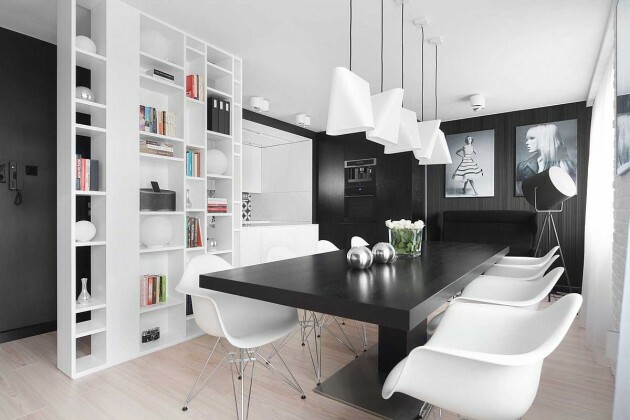 Widawscy Studio Architektury have recently completed the design of a contemporary apartment in Sosnowiec, Poland. Residents of the apartment are people who value simplicity, good design, high quality materials and courageous designs arranged. 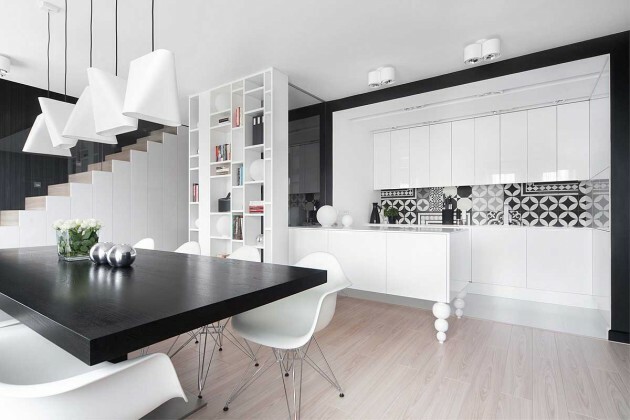 Three-level apartment occupies more than 120 m2 and is located in the center of Sosnowiec. Presented interior relates to the first level of the apartment where there is an open living space that allows residents and their guests to spend time together. The biggest challenge for the architects was to organize in a narrow interior attractive entrance area. The functional bookcase, which acts as a castellated “wall” separating the entrance area from the daily space. 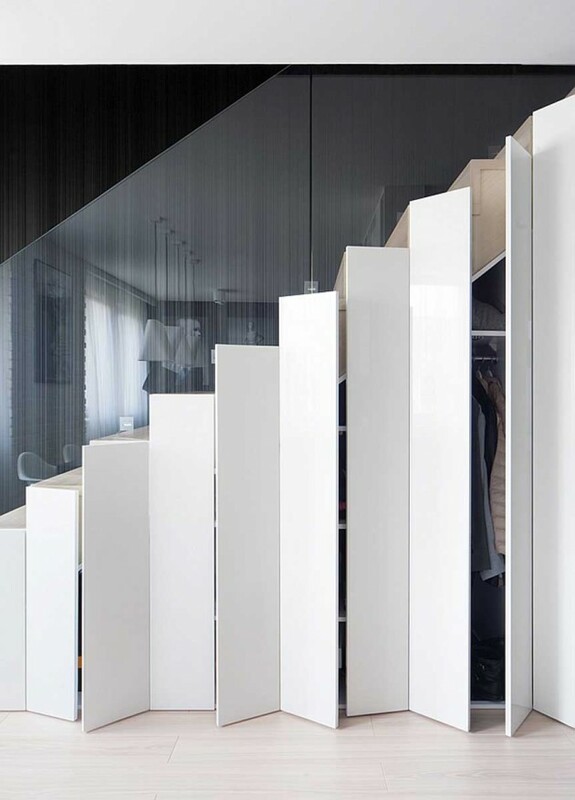 A form of stairs hidden inside a spacious wardrobe and shoes. 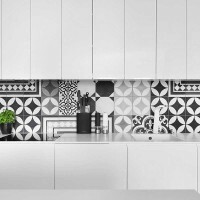 Minimalist white kitchen in the form of an annex was decorate with plates in black and white geometric patterns and rolled lacquered legs – accent from a distant era. The architects decided for a such contrasting statement of forms and patterns to give the interior an intriguing character. 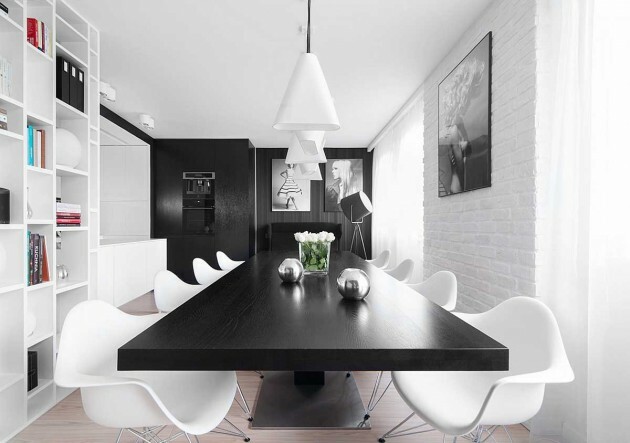 Because of a combination of monochromatic colors, various shapes, furniture and materials space is not monotonous. 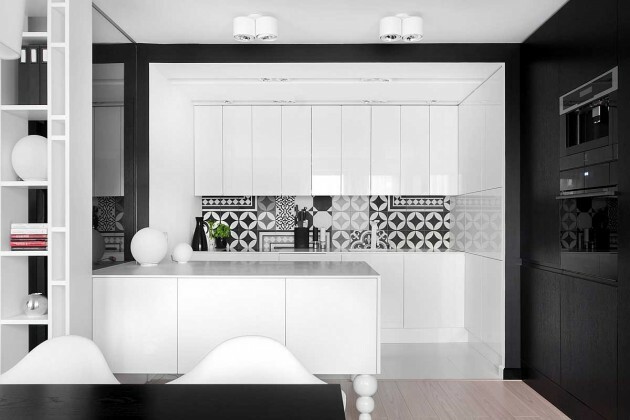 Glass elements and lacquered furniture surfaces used in the interior visually enlarge the space and give it elegance. Three-dimensional, black wallpaper introduced into the interior another structure and gives to interior a cozy, as well as class and style. The interior of the apartment has many roomy cabinets, eg. In the black furniture wall of the kitchen or under the stairs. Just behind the openwork shelf is the entrance to a small bathroom. 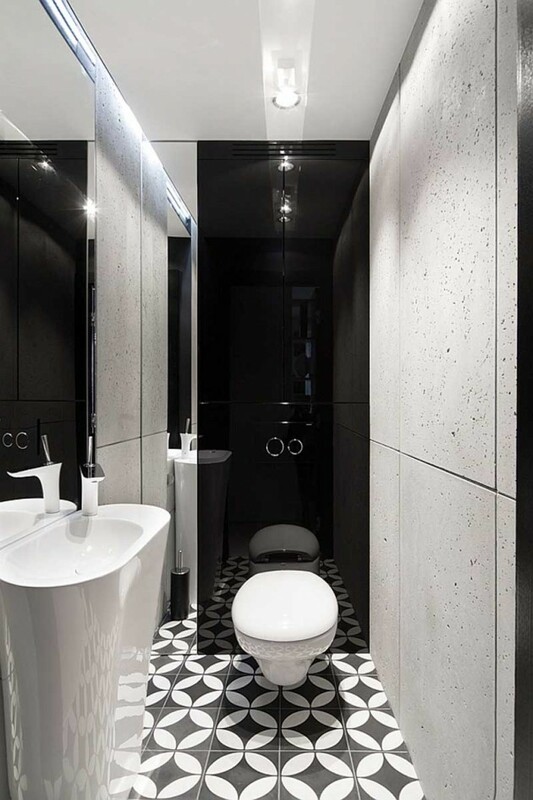 Its interior is also an example of a monochromatic play of textures and patterns – patterned floor , raw concrete, black lacquered MDF or mirror. 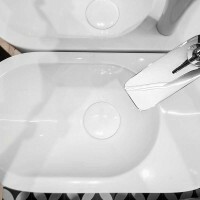 White, free-standing sink looks great against the mirrors and patterned floor. The architects used a few accents in the interior, which gave to it a character of photo studio. 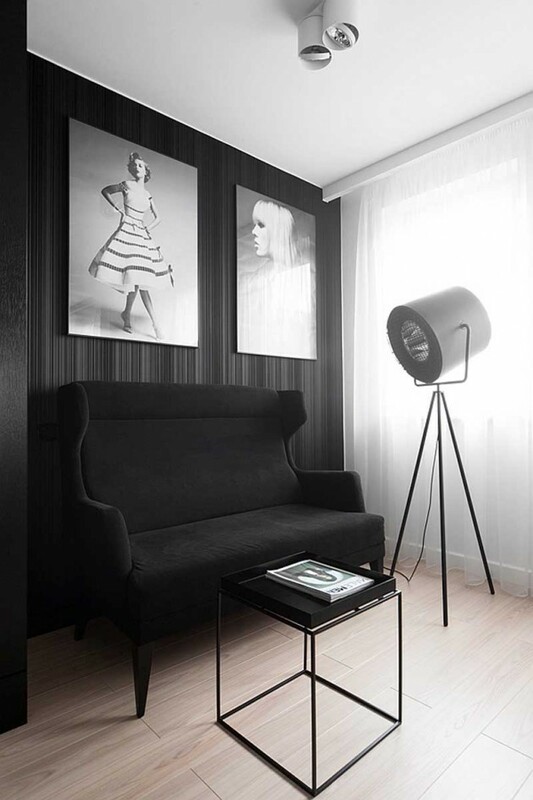 On the walls there are pictures of famous photographers and next the sofa there is stylized floor lamp inspired of studios lamps. On the next level in the area of communication was organized recreation space with a TV and comfortable armchairs. The walls of the corridor are finished with graphic, white-gray wallpaper.